Third revised edition, loaded january 18, 2016. Sûta said: "In the beginning the Supreme Lord assumed, for the creation of the worlds, the form of the Original Person[: the integrity of the material realm] composed of the sixteen elements [of the ten knowing and working senses, the mind and the five elements] and the cosmic intelligence and such. Resting in His meditative slumber in that water, out of the lotus that spread from the lake of His navel, Brahmâ was manifested, the master of the progenitors in the universe. One supposes the different worlds [as expansions] to be part of the form of the Fortunate One that constitutes the excellence of the purest existence. In a perfect [spiritual] vision His form is seen as having numerous legs, thighs, arms and faces, with wonderful heads, ears, eyes and noses, all glowing with countless garlands, earrings and dresses. This source of the multifarious incarnations is the imperishable seed from which the plenary portions originate as also the portions thereof, such as the gods, the human beings and the animals." "The first position the godhead [Nârâyaṇa] created was that 0f the sons of Brahmâ [the Kumâras] who performed the most difficult discipline of continuous celibacy. The Supreme Enjoyer secondly assumed the form of a boar for the welfare of the earth that had sunken to the lowest regions and lifted her up [from the ocean]. Thirdly He accepted His presence among the seers [in the form of Nârada Muni] for the sake of evolving the Vedic knowledge concerning the performance of devotional service free from material motives. Fourth born as the twin sons of [Mûrti] the wife of king Dharma He in the form of Nara-Nârâyaṇa subjected Himself to severe penances to attain control over the senses. Fifth He, carrying the name of Kapila, gave an exposition to the brahmin Âsuri on the nature of metaphysics and the elements of creation, because in the course of time that knowledge had been lost. Sixth as the son of Atri [named Dattâtreya] being born from Anasûyâ who prayed for Him, He lectured to Alarka, Prahlâda and others about transcendence. Seventh being born from Âkûti as Yajña, the son of Prajâpati Ruci, He together with His son Yama and other demigods, ruled during the period of Svâyambhuva Manu [and became the Indra]. Eighth, from the wife of King Nâbhi, Merudevî, the Almighty Lord took birth as King Rishabha and showed the path of perfection respected by people of all stages of life. His ninth incarnation He accepted in response to the prayers of the sages, whereupon He [as Prithu] ruled the earth for the sake of collecting ['milking'] her produces, which made her most attractive. Assuming the form of a fish [Mâtsya], He after the period of Câkshusha Manu protected Vaivasvata Manu, keeping him in a boat afloat the waters when the world was deeply inundated. Eleventh the mighty Lord in the form of a tortoise [Kurma] sustained the Mandarâcala Hill of the theists and atheists that served as a pivot in the ocean. Twelfth He appeared as Dhanvantari [Lord of medicine] and thirteenth He appeared before the atheists as an alluring beautiful woman and gave nectar to the demigods. In His fourteenth incarnation He, half as a lion, appeared as Nrisimha, who with His nails on His lap tore apart the king of the atheists like a carpenter splitting cane. Fifteenth He assumed the form of Vâmana [the dwarf brâhmana] who went to the arena of sacrifice of Mahârâja Bali to beg for only three steps of land, concealing His wish to regain the three worlds. In His sixteenth incarnation He [as Bhrigupati or Paras'urâma] saw that the ruling class was hostile towards the brahmins and acted twenty-one times against them. Seeing that the common people were less intelligent He, seventeenth, incarnated as Vyâsadeva taking birth from Satyavatî with Parâs'ara Muni as His father, for the purpose of dividing the desire tree of the Veda into several branches. Next He performed in a superhuman way having assumed the form of a divine human being [Râma], by controlling the Indian Ocean and such, so that He could act for the sake of the godly souls. Nineteenth as also twentieth Bhagavân took birth in the Vrishni family as Balarâma and Krishna and thus removed the burden from the world. Thereafter at the beginning of the Age of Kali He shall appear in Gayâ [Bihar] as the son of [mother] Añjanâ with the name Buddha for the purpose of deluding the ones envious of the theists [*]. "Dear brahmins, the incarnations of the Lord who appeared from the ocean of goodness are as innumerable as the thousands of streams we have from inexhaustible sources of water. All the powerful sages, the godly souls, the Manus and their progeny as also the Prajâpatis [the founding fathers] are aspects of the Lord. They are all part of - or plenary portions of - Krishna, the Supreme Lord [Bhagavân] in person who offers protection during all ages and in all worlds against disturbances because of the enemies of the king of heaven [Indra]. Anyone who in the morning and the evening carefully recites these mysterious births of the Lord, will find relief from all miseries of life. All these forms of the Lord that by the qualities of the material energy were created with the ingredients of the cosmic intelligence and other elements, originated from His Self-awareness that is without a form. They are there for the less intelligent observer to be perceived the way one sees clouds in the sky or dust in the air. This unmanifested Self in the beyond that cannot be seen or heard and has no form that is affected by the modes of nature, constitutes the reality of the subtle self [of the individual soul] who takes birth repeatedly. As soon as one by self-knowledge arrives at the rejection of all these gross and subtle forms that impose themselves on the soul because of ignorance, one arrives at the realization of the Absolute Truth. With the illusory energy subsided one is endowed with the full knowledge of enlightenment so that one thus being mindful will be situated in one's own glory. This is how the scholars arrived at the description of the birth and activities of the actually unborn and non-engaged Lord of the Heart; it is the hidden meaning of the Vedas. Residing within every living being He is the omnipotent master and witness of the six qualities [the six objects of the senses and the mind] and opulences [bhaga], whose play is spotless, who is independent and not affected by creation, destruction and maintenance. Because of His expert manipulations His activities, names and forms cannot be understood by the speculations and speeches of those with a poor fund of knowledge, just like fools cannot understand an actor's performance. Only he who renders unconditional, uninterrupted, favorable service to His fragrant lotus feet may know the transcendental glories of the all-powerful Creator with the wheel of the chariot in His hand. When one in this world succeeds in thus being cognizant with the Personality of Godhead who embraces all His universes as their Lord and who inspires for the complete of the spirit of ecstasy, one will never again have to experience there the dreadful repetition [of births]." 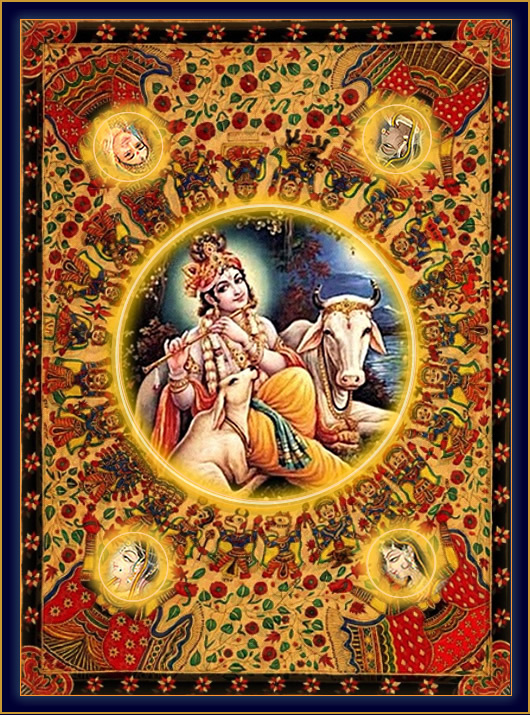 "This book called the Bhâgavatam about the activities of the One Hailed in the Verses [the Fortunate One, the Supreme Personality of Godhead Krishna and His devotees] that as a supplement to the Vedas [a Purâna] was compiled by the seer of God [Vyâsadeva], is there for the ultimate good of bringing success, happiness and perfection to all people. This story, that as the cream from all the Vedic literatures and histories was extracted by S'rîla Vyâsadeva, he delivered to his son who is the most respectable one among the self-realized souls. He [S'uka] in his turn told it to emperor Parîkchit who, surrounded by the greatest sages, sat down at the Ganges to fast until his death. Now that Krishna has left for His abode and with Him also proper conduct and spiritual insight have vanished, this Purâna bright as the sun has appeared at the horizon for the sake of everyone who in the Age of Quarrel [Kali-yuga] has lost his vision. Oh brahmins, when the story was recited there by that powerful great sage, I, being perfectly attentive by his mercy, also managed to understand it, so that I will now relate it to you also, exactly as I learned it free from deviations by my mind." Source: 'Exoticindia.com, Used with permission.